A coonhound named Loshay was lost and hurt on the side of a road in Richmond, Virginia when a complete stranger came to his rescue. 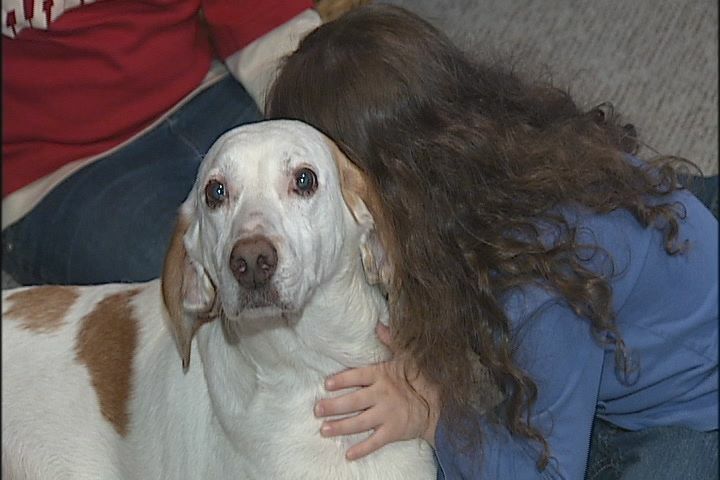 Loshay, a white and red coonhound, escaped from his home on Friday. His family desperately searched for him. They searched on foot and drove their car around until it ran out of gas. Meanwhile Shannyn Sneed was driving when she spotted Loshay on the side of the road. She quickly pulled over her car to help him. Loshay appeared to have been hit by a car and was whimpering. Sneed comforted him until help came to take him to an emergency veterinarian. Loshay had serious injuries to his back legs. He is still unable to stand and his back legs may never recover fully. The Sabir family learned of Loshay’s accident and injuries when they went to look for him at the local shelter. He is now home with his relieved family as he recovers. On Monday the Sabir family finally got to meet the woman who saved their dog’s life. When Ruby Sabir and Shannyn Sneed finally met, both women burst into tears. What an angel. I am glad you were there and saved his life. great women ,great story!have a wonderful year !